A sapphire ring found in North Yorkshire has sparked a meeting of experts to determine exactly when it was made. The ring has baffled archaeologists because it is unlike any other according to the Yorkshire Museum. The intricate ring, presumably made by a highly skilled craftsman, is on show at the Museum in York. Natalie McCaul, from the museum, said the meeting may "shed new light on the ring" and "reveal some of its secrets". The museum said the ring's style and material made it hard to date but it could have been made any time during the seventh to 11th centuries. The ring was found at Escrick, south of York, by a metal detectorist in 2009. The ring measures around 1 inch (2.5cm) across and is made of gold, glass and a large sapphire. Ms McCaul, curator of archaeology, said: "This beautiful ring has really got us puzzled." 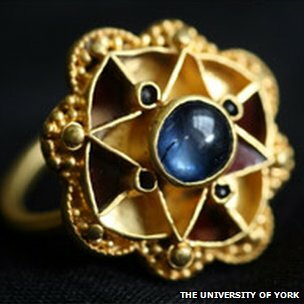 Experts from UK universities and museums are to attend the meeting in York along with the maker of a replica ring. He would explain the skills used to remake the ring and how this might compare to the original craftsmen. This is the second known use of a sapphire in jewellery found in the country, the first being a 5th Century Roman example, said the museum.